Formally the owner of a software computer training company, Cindy made the decision a few years ago to say goodbye to corporate America and work full-time at pursuing her passion as a home chef and entertaining expert. Whether it’s a holiday, special event or dinner party, Cindy believes in taking the stress out of entertaining and creating family memories in the kitchen that will last a lifetime! 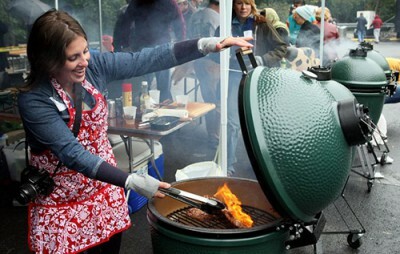 Set the EGG, the best outdoor grill, for direct cooking at 650ºF / 343ºC. In a large sauté pan over medium heat add olive oil and the onions. Cook for about 5 minutes, stirring occasionally, until they are golden brown. Add in cherry tomatoes, garlic and thyme and cook for about 6 minutes. Keeping the heat on medium, stir in the marsala wine, deglazing the pan. Add the beef broth and the dijon mustard and whisk until it is all incorporated. Whisk in half and half then season with salt and pepper and lower the temperature. Cook for about 5 minutes, or until the sauce starts to thicken. In a large pot of boiling water cook the penne pasta (add 2 tablespoons of salt) for about 11 minutes or follow package directions. Drain (except for 1 cup for reserve). **If too thick then add in some of the pasta liquid. Add the tenderloins to the center of the cooking grid on the EGG. Grill for 3 minutes one side (time it for 3 minutes – DO NOT touch the meat) then flip and shut off the EGG and let the tenderloin grill for 3 minutes (or more if you want your steak well done). Add pasta into the sauce pan and coat with the Marsala mixture for 1 minute. Remove from heat, add the steaks and basil and serve immediately with parmesan cheese.